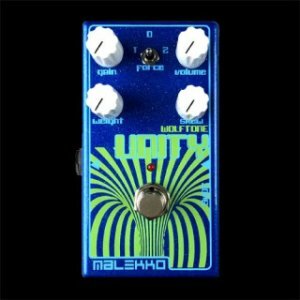 The Wolftone UNITY is proudly hand built by Malekko in-house in Portland, Oregon using the highest quality components! The Weight knob has two functions: controls both initial tone/gain (muted to bright) and the amount and depth of the compression, from a fast attack to heavy squish. 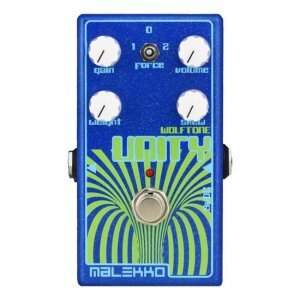 The Gain knob controls the amount and depth of the distortion, from sharp and bright to thick and heavy. The Skew knob adjusts the saturation and tone of the effect, from dark to bright. The Weight switch has 3 positions. It selects the degree of compression. 0 min, 1 high, 2 max. Generally speaking, the higher the WEIGHT or GAIN are set, the more compression there will be. Conversely, the lower the SKEW is set, the more it will compress. When WEIGHT is set low, high GAIN and SKEW settings will bring in a gating effect. Slow attack swell happens when WEIGHT is high, GAIN and SKEW set low. 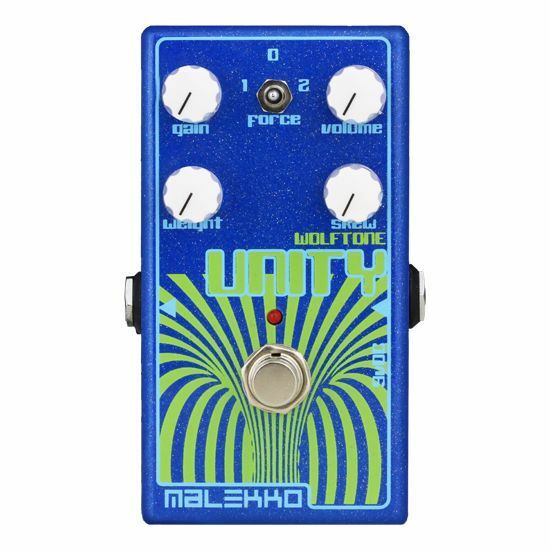 Compression is interdependent on the WEIGHT, GAIN, and SKEW positions, so this pedal cannot be used as a “compressor”.